It’s my last week of teaching the infamous J-term (the choose-your-own-adventure-entire-semester-taught-in-one-month welcome-to-teaching month), and with two classes left to teach I can say I’ve learned a lot and I’ve a lot more to learn. It’s always satisfying when it breaks down like that, isn’t it? I know that I would alter the syllabus of the course, starting with the text I’m ending the course with and then working my way through the books (oh, right, the course is SEM 1145: The Collected Poetry of Ted Hughes & Sylvia Plath), but I feel like, overall, I’ve had a good run of my first time teaching. And even better was discovering that I like it. Love it. Want to do it forever and ever. (Not forever and ever, but more the affirmative, yes, you need to get that PhD kind of thing). Life can be good–I dig that. Back in food news though, if the Quick Quinoa Salad wasn’t quick enough for you, though, how about this delicious and really darn fast noodle dish from the folks at Serious Eats? 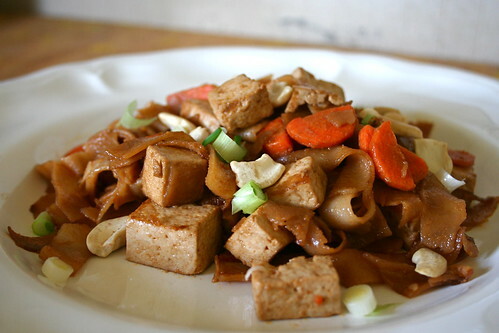 Spicy Noodles with Tofu. Dou Hua Mian. It took about 10 minutes to make, maybe 15 tops, and is, officially, my favorite, super easy Chinese-ish dish. I took a few liberties with ingredients, but not many, and simply switched the flat Chinese noodles to large Thai rice noodles because that’s what I had on hand. The best part of the dish, to me, was the light hot kick to the palate that the chili oil brought. At first I thought that much chili oil in any recipe is a bad idea for anyone sensitive to heat, but I think it’s a crowd pleaser–and especially good for those who do like heat. Although the recipe serves 4, I halved the recipe and chowed down on it for dinner and lunch last week. Oh, and the quick pickled carrots? Love. Love love love. For the quick pickled carrots: Slice carrots in half lengthwise, and then thinly slice crosswise. Place in medium-sized bowl with salt and sugar. Toss well with fingers, and set aside for at least 10 minutes, stirring occasionally. When ready, drain away any liquid that has collected. Meanwhile, fill a medium-sized saucepan halfway up with water. Bring to simmer, add tofu. Cook until tofu is hot, about 5 minutes. Turn off the heat and drain tofu. Bring large pot of water to boil. Add dried noodles and cook according to directions on packaging, usually about four minutes. Drain noodles when done. Meanwhile, combine tahini, chili oil, tamari, dark soy sauce, and sesame oil in large bowl. Whisk until smooth. Transfer noodles to large bowl with sauce. Toss well. Add carrots, tofu, cashew, and scallions. Serve immediately. I love it! All of the ingredients are things I always have on hand, it looks delicious, and you can’t beat the prep time. I’m definitely going to make this the next time I want dinner in a hurry. Amazing how quick pickling actually pickles. This looks like a great dish. Glad you’re enjoying teaching! I got close but never actually had (made?) the chance to try it. This looks really, really, really good. I’m going to have to try it out soon! And congrats on surviving J-term and, better yet, learning that you love to teach! I’ve thought about a PhD on and off, but I think I’d have to actually teach a class before I make any decisions. And get an MFA. That’s the first step! But mostly I’m thinking about those noodles! That all sounds really good, but I’m just not really a fan of using like sesame oil…Teriyaki either actually. I think the idea is great though! Looks super good for such a quick dish, my kind of food. Glad to hear you love teaching! This sounds simply delicious, Jes. I love how you did the quick pickled carrots – salt and sugar, just like that. I can see why this dish is a go-to meal! I think what I love most about this recipe are the quick pickled carrots – but I’m a sucker for anything pickled.